Love a backpack but don't always want to carry it? Well, that is where this trolley computer backpack comes in. It is great for taking that load off when you need to. 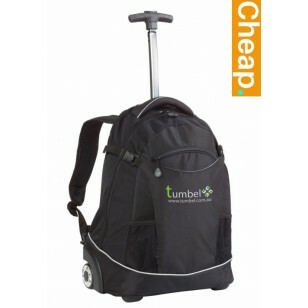 Looks just like a regular backpack except it has recessed wheels and a telescopic handle. Backpack is made from ripstop and 600D polyester for durability. It has mag wheels are made to last. Main compartment is fully padded and features a zippered closure. There is also a front zippered compartment as well. There are also two size straps with buckles to adjust thickness and stabilize backpack. It also has two feet to help protect bottom of the bag. It also comes with great padded adjustable shoulder straps for comfort. There is also a protective flap with clasp on front of backpack as well. We deliver bags in bulk quantities only within Australia. Pricing excludes GST. Our displayed price on our website includes a 1 colour transfer print of your logo. There is also a branding set up fee of $75 applies to personalized orders. A full color print of your graphic is available for an additional: $3.00 each. Pricing is in Australian dollars and does exclude GST.